Scuba Diving Tenerife often surprises. Rarely do people expect to find such warm, clear water – abundant with marine life – within Europe. Our boat is moored in Los Cristianos harbour, only around 5 minutes from the dive centre. This proximity means shorter journey times to dive sites than is common on the island. 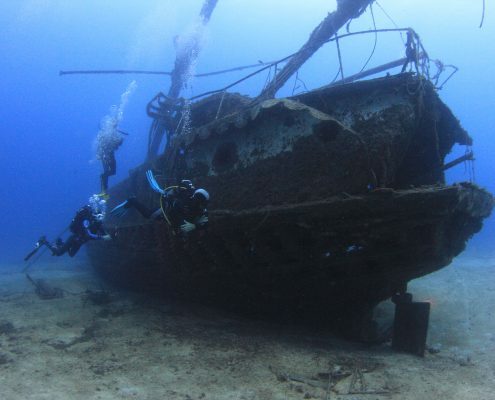 Within just 15 minutes boat ride we have access to some of the most popular and impressive dive sites in Tenerife. The vast majority of the time we dive from our boat. 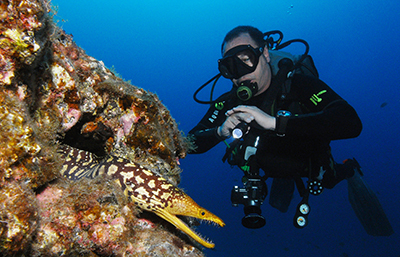 We have ready access to dive sites which offer something for everyone, from novice to expert. We make a minimum of two dives a day, and we always return to land between dives. This means you do not have to do both dives if you do not want to. If you only do one dive then you’ll be provided transport back to the dive centre immediately upon your return from to land. This is by far the most popular dive site in Tenerife. This popularity is thanks to the resident turtles who can reliably be encountered here. 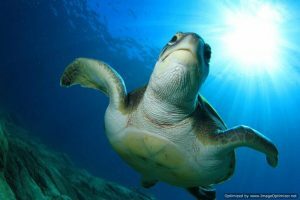 Alongside the turtles are many different species of fish in large numbers. 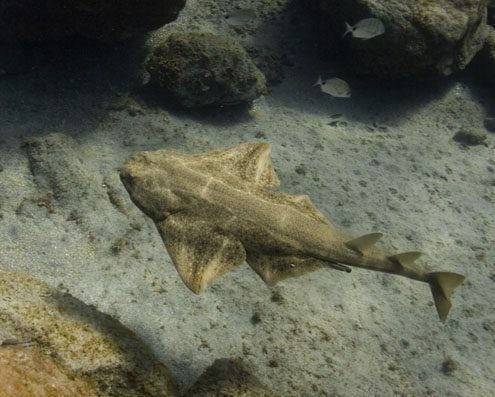 It is also common to encounter various different species of Ray, as well as Angle Sharks during the winter months. We are also always on the look-out for dolphins who take advantage of easy meal opportunities at the nearby fish farms. 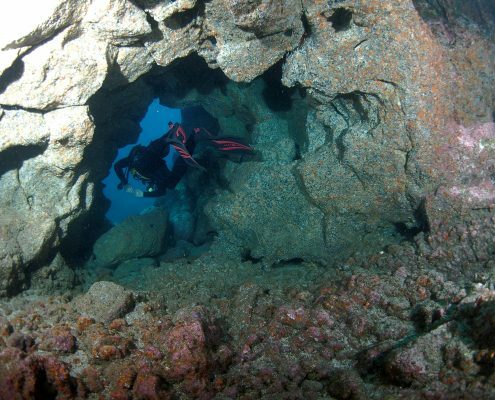 This dive site offers very easy diving conditions, making it both interesting and accessible for all levels of diver. This is where we also bring snorkelling tours as well as conducting our PADI Discover Scuba Diving programme here. From an anchorage in 16m we first make our way down a wall where we find many varieties of Morays hiding in the cracks. At the end of the wall we cross over the sand to some magnificent pinnacles that you can weave your way around, paying your respect to the Virgin del Carmen statue that was laid in 32m for the protection of both divers and fishermen of the island. Looking across from here you will see a carpet of garden eels. As you make your way into 28 meters you will be at the cave entrance. However this is not to be fully penetrated due to it leading into a maze of lava tunnels. A small cross at the entrance is a grim reminder of those who went in and never came back out. 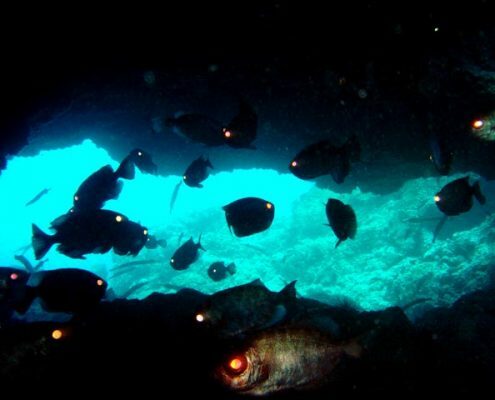 The mouth of the cave has enough to keep you occupied however as it is teeming with shrimp and it is not unusual to see rays or angel sharks asleep in the sand. A favourite among those qualified for deep diving. With the area of Palm Mar famous for under water rock formations it is no surprise that this dive site has a fascinating topography. With the starting point on a plateau you drop over into an amphitheatre structure where the discovery begins. Trumpet fish, Moray eels and Big Eyes all take shelter within the rocks. There is a large shoal of Roncadores floating effortlessly mid water here which provide fantastic opportunities for photographers. Very often a smaller shoal of barracuda are hovering above, waiting for a meal opportunity. This site offers gentle diving suitable for all levels with plenty of life. A deep dive with tantalising drop-offs, this is a fix for any deep diving junkie. We sometimes get strong current here, therefore this is for experienced divers only. As we descend we are often greeted by large grouper lazily mooching around in the overhangs. 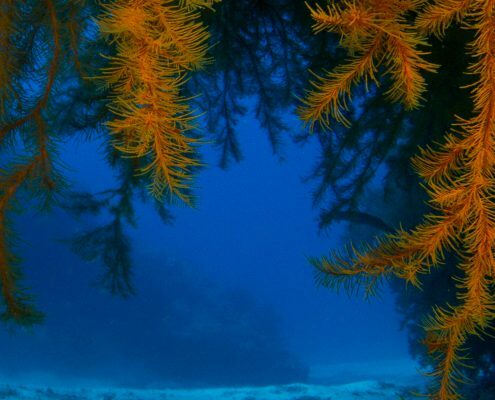 Peering over the drop off, we see black coral with the appearance of Christmas trees sprouting from the rocks. We soon come across a prominent pinnacle, base camp for a swarm of barracuda. Following the underwater gorge, as we head towards the shallows, we may be passed by stingrays and schools of sardines. This is the wreck of a WW2 German minesweeper which arrived in Tenerife in the 70’s. Upon arriving in Tenerife the local mafia stole the ship and sold it on to a third party in Los Cristianos. Here it was used as a Dolphin watching vessel before being scuttled in 2005 for us to enjoy whilst diving and now lies upright on a sandy bed at 30m. We can encounter Jacks, Rays, Grouper, Angel sharks and occasional dolphins as we make our way around the wreck and up to the Crow’s Nest before making our safety stop. An advanced dive for its depth and occasional strong currents. The Condesito, a freighter carrying cement for the construction of Los Cristianos, was wrecked on the shoreline near Punta Rasca in late 1971. No lives were lost. 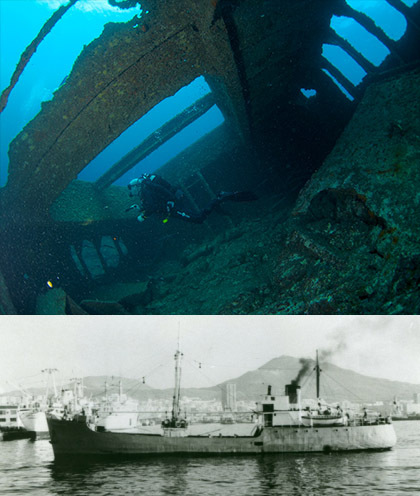 Decades later and although the wreck is disintegrating, leaving it largely impenetrable, the life here continues to thrive. We can expect to see huge trumpet fish, octopus, cuttlefish, barracuda and many more. Situated in a sheltered bay, this site offers great diving for beginners and more seasoned divers alike! The fingers of lava either side of the wreck are also worth exploring. A great spot for snorkelers too. A very picturesque site – this is a favourite for all. You start shallow where there is abundant flora on the plateau. Heading along the coastline into the depths, the sandy bay leads you to the entrance of this large cavernous swim-through. At the entrance you can see the exit – cobalt blue sea framed by jagged volcanic rocks at the exit to this cavern filled with glass-eye fish. The cave area is home to many trumpet fish, bream, big eyes, shrimps and you never know what else is lurking. Large stingrays are often sighted inside and also spotfin burrfish sometimes like to hang out in the area. One of our favourites, this is a site to suit everyone from snorkelers to deep divers. With some of the most outstanding basalt rock formations, you won’t know where to look first. Throw in the added fun of swim-throughs, black coral and a shoal of Roncadores and you can’t fail to enjoy yourself. In addition, a dive here is like swimming in a bowl of fish soup! Barracuda, bream, trumpet fish, Canarian lobsters – you name it and it’s here. 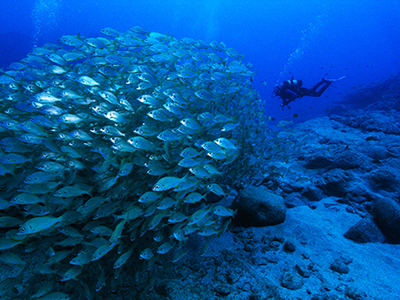 Roncadores del Faro is one of the most popular diving spots in the area. La Caleta reef is a long, thin finger of rock sticking out perpendicular to the shore. At it’s origins it appears above the waterline forming a small island only slightly separated from the coast, and the reef creeps gradually deeper as we head away from land. The sandy bottom reaches a maximum depth of approximately 25 metres, making this site suitable for all diver levels. Erosion over time has led to the formation of a number of long overhangs in which we can hunt for stingrays. Barracuda, cuttlefish, octopus and various types of bream are regularly encountered here. The turtles suffered injuries and became ill as a result of all of this attention. During the summer of 2016 a local animal sanctuary rescued two of the turtles in order to bring them back up to health. Presently there is still one turtle who is occasionally seen here. Playa Paraiso is one of our furthest dive sites, and one which can be accessed by boat or from shore. A 5 metre platform spans away from the coast, and drops off to a sandy bottom at around 15 metres. From this ledge a solitary finger of rock sticks out perpendicular to the shore, which is where most of the dive is to be spent. This finger of rock is well eroded and has an almost continuous overhang all around it’s edge -making for a come very cool scenery. This is only enhanced by the various large boulders which have broken off this rock over time and create a mini labyrinth to explore and get lost in! In one small crack rests a large and historic-looking anchor which was lost here by some unknown ship, and certainly enhances to the ambiance of the dive. A school of Roncadores can be found here, along with many nudibranchs, cuttlefish and all of the usual Tenerife suspects. Some of the best scenery here is just a little below the 20 metre mark, meaning it is better for those with Advanced Open Water certification of higher. Due to the long journey time and the fact that we often encounter rough seas, this dive is most commonly done from the shore – see ‘shore diving’ tabs below. Located below the majestic Montaña Amarilla – an ancient fossilised sand dune – this is one of the prettiest dive sites topographically. We anchor in 8m on a platform and drop off between two pinnacles down to 14m. Following the reef, the dive is more or less a circular route where it is possible to achieve a maximum of 24m but can be enjoyed just as well at 18-20m, making it ideal for Open Water divers. We always encounter a shoal of Roncadores just off the end of the reef, which is fascinating to observe. We return over the top of the reef, making a nice multi level ascent up to 10m where we´re on the lookout for Octopus and Cuttlefish. Most days we make at least two dives from our boat. To add some variety, on occasion we plan a day of shore diving. 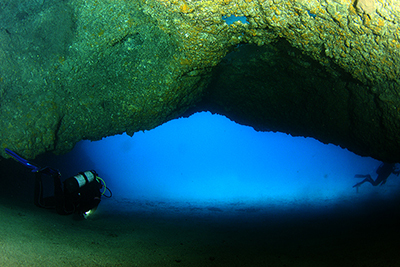 There are many beautiful and interesting dive sites around the coast of Tenerife. Shore diving allows us extra variety on the dive sites we are able to show you. Most commonly, we dive from the shore when the weather is not suitable in our part of the island. Due to the distances involved, when shore diving we always make two dives before returning to the dive centre. Therefore, if you wish to dive on these sites then you will be committing to making two dives. Located below the majestic Montaña Amarilla – an ancient fossilised sand dune – this is one of the prettiest dive sites topographically. We have a short walk down a a stepped slope to a large concrete ledge – from here a giant stride entry may be possible on a calm day at high tide, otherwise a steel ladder allows you to lower yourself gently into the shallow water. At first we swim over some algae-covered boulders with many beautiful anemones squeezed in between them and head out towards a series of giant rock pinnacles which tower over us from the 20 metres sandy sea-bed up to the surface of the water. Here a swim-through and numerous little crevices in the rock make this fun and impressive topography, and schools or barracuda and bream take refuge thanks to the site being declared a mini-marine reserve. From where we can park the car, the walk down to the entry point is not the easiest; but well worth it when you get there! A ladder and a low rock ledge allow different options for entering the water, but in either case we start this dive inside a large pool – surrounded on the surface by volcanic rock! As we drop below the surface the route becomes clear: a short tunnel leads to another open-topped chamber, which in turn leads towards another dark cave or out into the open sea! Certainly an exciting start to the dive!! Out in the open sea, we follow the rocky coast at a depth of around 15 metres until we come to a giant school or Roncadores! which usually marks the turn-around point of the dive. This dive is like an underwater playground and would be a super-fun dive even without the beautiful and varied marine life which we can encounter here! Alcalá is a picturesque little town on the way up towards Los Gigantes. The town is built around a small natural harbor which provides shelter for us divers, as well as a pretty awry of marine life. The route follows very simply along a string of low-lying rocky reefs and the occasional visit from a turtle can make for a pleasing surprise. This is not one of the most stunning sites, but is a very easy and gentle one which makes it a great playground for training dives or for inexperienced divers who want to have some practice. We start this dive at the harbour wall on the Eastern edge of the bay in the town of el Poris. From here, we put the land on our left and swim out towards the headland. This dive starts with a sandy bottom and a bed of sea-grass. Here we can hunt for small crustaceans, octopus or cuttlefish. As we follow the sloping bottom we swing back towards the coastline to enjoy the stunning shapes which appear in the rocky headland. There is a surprising amount of fish life here, as well as being a great place to hunt for some beautiful nudibranchs. This dive is a very simply ‘out-and-back’ route, but the bizarre shapes and forms in the rocks don’t make the return journey feel at all monotonous – on the contrary – you are bound to spot loads on the return route which you missed just a few minutes earlier. In the town of Las Eras is a stony beach, protected by a man-made breakwater. From the car park directly across the road from the beach we have a very short and easy walk into the water and start the dive in similar fashion: blowing bubbles in the shallows as we traverse the bay, gradually following the bottom down to around 10 metres where we pass the breakwater. From here we put the land on our left and explore the varied scenery as we gain depth until eventually hitting the sand bottom at around 30 metres. There are large groups of fish encountered at every stage of the dive, and on the return journey a swim-through adds to the excitement and ambience. 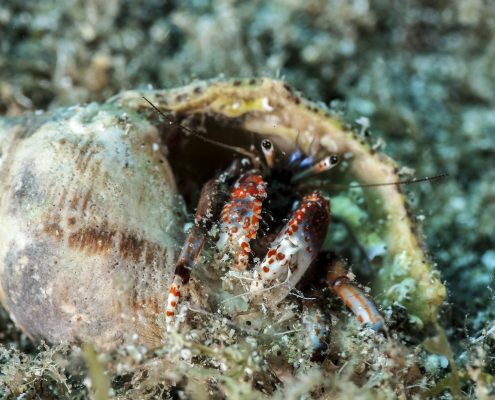 As with most shore dives, we have something to see at every depth and do not have to go to 30 meters if we don’t want to – this site is suitable for all levels of divers and rarely disappoints. A favourite for Wreck Specialty courses. Depending on the tide, entry is either via a salt water pool fed by the sea, or down steps leading directly into the sea. The wreck previously worked as a tug boat in nearby Santa Cruz and was sunk in 2006 as an artificial reef when it reached the end of its working life. It has been partially stripped out to make it safe for penetration diving and gives us ideal training conditions. Following a pipe down a sandy slope we have the opportunity to hunt for seahorses and various types of nudibranchs and crustaceans. At around 20 metres a quick detour to the left reveals a monument with – of all things – a statue of a dog. At this monument we also see the anchor of the wreck, and can follow the anchor-chain along the sea-bed bringing us down to 30 metres before leading us into the shadow of the wreck. 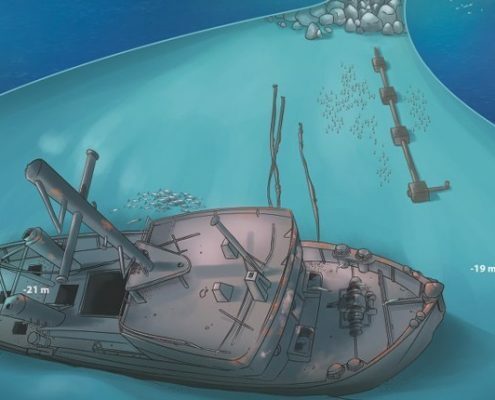 The wreck itself is not huge, but there are a few small penetration points for experienced divers with good buoyancy control. Sitting so high above the sandy bottom, however, this wreck is a fantastic artificial reef and within just a few short years has become home to a staggering fish population.